At the transfiguration, the glory of the Father was clearly seen in the Son. As one eyewitness, the apostle John put it: And the Word was made flesh, and dwelt among us, and we beheld his glory, the glory as of the only begotten of the Father. Peter also wants us to view the Transfiguration in a certain way. He wants us to see in it the clarity and certainty of the Scriptures so that we may have the certainty of faith and a merry conscience. 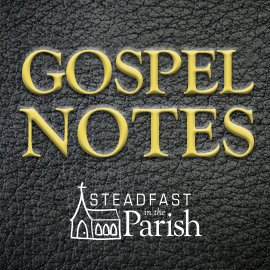 In today’s epistle, Peter answers the question: “Why should I trust that the Scriptures are true and inspired by God?” His answer is, because the Bible says so. Now that may sound like circular reasoning, but Peter explains that the self-truth of the Scriptures is entirely valid. Peter and the rest were eyewitnesses to the fact that Jesus is the Messiah. They heard the voice from heaven. They saw the glory. They were witnesses of his resurrection and the truth of his words and deeds. And since we know that Jesus is the promised Messiah, we also know that the prophets who predicted his coming in detail were true prophets of God. The prophetic word is all the more sure and confirmed in Christ’s fulfillment of it. All the promises of God find their “yes” in Jesus. Therefore, says Peter, the prophets were writing under the inspiration of the Holy Spirit, even as Peter and the apostles speak not as peddlers of mythologies but as authoritative spokesmen of the risen Christ. Peter had learned his lesson well. The Transfiguration was not a scenic area to be enshrined in tents, but a powerful witness to the certainty and clarity of the Scriptures. Yes, the word-for-word, or, verbal inspiration of Scripture is a matter of faith apart from which one cannot be dealt with as a Christian. But verbal inspiration is a matter of faith based on genuine history and objective, compelling evidence. Peter is not like Mohammed or Joe Smith claiming to have found some new holy book while he was off by himself in a cave and you should believe him just because or else. Peter invites critics to hear the evidence, test the claims of the Scriptures and those eyewitnesses who claim its fulfillment in Jesus and who have nothing to gain and everything to lose from saying so. Thus does Peter argue that the Scriptures are certain and inspired. But there’s more. Peter also invites Christians to see that the Scriptures are bright and clear, just as Jesus shone brightly and clearly at his Transfiguration. “Thy Word is a lamp unto my feet and a light unto my path.” The Scriptures are not dark, obscure, and masked in a code language that no one can figure out except for Joseph Smith or the Pope or the local charismatic megachurch preacher. Rather, Scripture is a light shining in a dark place. It does not need another light to enlighten it. Just as the sun produces its own light, does not need to be illuminated from without, and still shines brightly even if I close my eyes to it or look away; so God’s Word is self-illuminating and does not need clarification from the outside. It can be known and is not subject to personal interpretations. It means what it means even apart from you and me. There is no “Bible code.” It works according to the normal principles of human language, and the syntax and grammar of Greek and Hebrew. God, the author of human language, is able to communicate. He is not like the college student who never learned how to write clearly. Stick with me here and let’s do a thought experiment. For the sake of example, let’s pick something easy, like drunkenness. What does the Scripture say? Ephesian 5:18: “Do not get drunk with wine, for that is debauchery.” Notice: There are no hard words here. It’s not a secret code. There are spots in the Bible that require comparing passages and letting Scripture interpret itself. This isn’t even one of those. The meaning is clear. Drunkenness is debauchery. But post-modernism and error of the unclarity of Scripture say: “Yes, but it says, don’t be drunk with wine, so what about beer or hard liquor? That could be okay, right? And what if we use a designated driver? And really what does it mean to be drunk? Is it .05% BAC? .08% I mean really it’s different for everybody and it depends on the day. Besides, you can theoretically get drunk on things besides alcohol. And what if I wasn’t actually “drinking” but eating it via jello? And who was Paul’s audience? Maybe he was only speaking to older people and not college students? And besides, that was just his culture. No one in our culture is seriously offended when college students have one too many. And aren’t I free in the Gospel? At this point, I pretty much have to drink another or risk being a Pharisee.” And on and on it goes until people conclude: ah! the Scripture isn’t clear. We can’t really know what Paul meant by “Do not get drunk with wine, for that is debauchery.” There is no real meaning, only what it means to me. Peter says the Scriptures are bright, a lamp shining in a dark place. What comfort to see the light when I have been lost in error’s dark maze! But much of Christianity denies this either dogmatically or functionally. The Pope says the Bible is too hard to be clear. Tradition and his magisterium are the only clear interpreters of Scripture. But really, how clear are the popes? Who interprets them? One would think he would have written a definitive commentary by now answering every question so that we can all move on with our lives. The East also denies the clarity of Scripture. They too say that you have to have Scripture plus church tradition, and by “tradition” they usually mean a snapshot of what 8th century eastern Christianity largely taught. The Episcopalians say you need Scripture plus tradition plus reason. The Methodists and many American Christians add experience to the list (ironically the very thing St. Peter resists in today’s epistle). It’s not uncommon in American churches to have an “anointed” vision-casting leader whose experiences come alongside Scripture. So instead of one pope in Rome, you get a thousand mini-popes who can speak outside of—and in many cases—contrary to Scripture as they illuminate the “true” meaning of the words which they often say is “hidden” or “secret.” Of course, I am not speaking against the need to study and learn Scripture along with the language and context in which it was written—only against the notion that Scripture is unclear and not a bright light. Beloved of God, this is a real bother for all Christians. I am not trying to make light of it or poke fun at Christians who are confused on this or that point of doctrine. When the voice of that sneaky snake rears his head and whispers: “Did God really say?” my sinful flesh is driven to any number of false comforts. Erect a papacy. Establish an infallible tradition. Claim special knowledge or a religious experience. Find the most charismatic preacher, or the one with the most advanced degrees, or the cutest kids, or whatever. But those are all false comforts. God has certainty for you and has placed it in his clear word. For you who are bothered by all this, Peter gives you this comfort: We have the prophetic word more fully confirmed, to which you will do well to pay attention as to a lamp shining in a dark place, until the day dawns and the morning star rises in your hearts, knowing this first of all, that no prophecy of Scripture comes from someone’s own interpretation. Sometimes I think that when people hear Lutherans talking about the Transfiguration clarity and brightness of Scripture, all they hear us saying: “Scripture is clear to us. Our beliefs are obvious to us.” But that’s not what we’re saying. We’re saying what Peter says. We’re saying that the clarity is in the Scriptures themselves. They are a light, a lamp, bright. The brightness is objectively there, even as it was in Jesus when he was transfigured. Don’t let anyone, least of all your own heart, steal this comfort from you. Stick to the Word, and you will have the certainty of faith. Stick to the Word, and you will have all you need. Stick to the Word and Christ, the morning star, will arise in your hearts. When you look at your heart, the longer you look, the more uncertainty you’ll find. If you merely ponder the things of God in your own thoughts, you will get lost in the dark and despair. Stop doing that, says Peter. Pay attention to the words of Scripture. It is a shining lamp. Where the Word is, there the Spirit is working, bringing faith and the entire kingdom of God. Did God really say? Yes, he really did. For no prophecy was ever produced by the will of man, but men spoke from God as they were carried along by the Holy Spirit. Be not distressed. The Lord has spoken through his prophets and apostles. Yes, in these last days he has spoken to us through his Son—and he has done so clearly. The commands of the Lord are radiant, giving light to the eyes. O Lord, My soul fainteth for thy salvation: but I hope in thy word. Thou art my hiding place and my shield: I hope in thy word. Uphold me according unto thy word, that I may live: and let me not be ashamed of my hope. Hold thou me up, and I shall be safe: and I will have respect unto thy statutes continually. I prevented the dawning of the morning and cried: I hoped in thy word. 148 Mine eyes prevent the night watches, that I might meditate in thy word. I wait for the LORD, my soul doth wait, and in his word do I hope. Cf. Quist, The Reason I Believe, 54–55. As a lifelong LCMS Lutheran, a lowly layman, I have been exposed to its teaching since before I was born. Sunday school, 10 years of Lutheran parochial school, confirmation instruction, home instruction and devotion. It came as quite a revelation when I entered public high school and later public university, and began pitting my supposed scriptural expertise against that of my friends, that much if not most of what I had been told from religion class, Sunday school and the pulpit about other Christian denominations was simply wrong. Much of what Pastor Hayes writes is quite beautiful but he then descends into an uninformed criticism of other faiths. I am currently attending RCIA, catholic adult instruction, with my wife of 36 years. (She is Roman Catholic, I do not currently intend to convert). Weekly we are given extensive scripture passages to read and encouraged to read the Bible on our own to see what it truly says and says to us just as Pastor Hayes suggests. At no point are we told scripture is in any way unclear or must be interpreted through the Pope; we are encouraged to (and I do) challenge Catholic dogma. I have intermittently attended Catholic churches for almost 40 years and have never heard anything other than a clear exhortation to study the Bible. The statement that Roman church denies the “clarity of scripture” is wrong. Be glad to send our study guides. Similarly the assertion that the Eastern church denies this is incorrect. My baby brother (who was even more die hard LCMS than I growing up) and is now Greek Orthodox, and I have had extensive conversations about his denomination and his conversion to Orthodoxy. (His background includes PhD in history, reads Greek, Latin and Hebrew, and graduated from LCMS seminary in Fort Wayne). His church does not teach that scripture is in any way unclear. Nor is it, as suggested, stuck in the 8th century. The capital T traditions it embraces are the writings of church theologians through the ages back to the beginnings of Christianity. These, it has been pointed out by others, are analogous to and include the writings of many theologians including the reformers. Nor are they necessarily to be accepted without question as they are not scripture. By contrast article II of the LCMS constitution stipulates that a member “accepts without reservation” not only Holy Scripture and the creeds but also the Augsberg confessions, the Book of Concord, and the Large and Small catechisms and Smalcald letters of Luther in order to remain in the church. Capital T traditions, extensive Bible interpretation by humans. The latter may or not be inspired but are not the Word. I have no first hand knowledge of the other denominations of which Pastor is critical. Our denomination always seems to lose its incredible beauty, message, traditions, music, liturgy, to its uncontrollable need to be critical, “right” and condescending even when we don’t know what we are talking about. No faith or trust in the Holy Spirit. He’s bigger than the LCMS. A mighty fortress is Our Church. The rest, we’d say, are failing. Contentiously upon our perch, against most trends we’re railing. 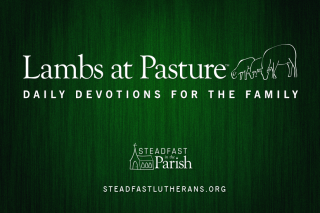 Beyond strive many a foe – non-Lutherans we don’t know. In our own heads prevailing. They follow Christ; it matters not. Their doctrine is contorted. Pure Gospel they just have not got. That Message they’ve distorted. Let fierce debate begin, for we shall surely win. The Turkish threat brought unity. Before, we had division. Now we demand conformity, resisting all revision. Unless we think alike, variety will spike. That only leads to sin. New thoughts must be reigned in. Our past remains our vision. We guard this culture with our might: Our forbears shall think for us. All that they said is surely right. Their writings shall preserve us. Whatever may arise, let quoting them suffice. Though grace we preach each day, it’s not ours to display. We’re best when we’re pugnacious. If people choose, they come to us. Whate’er their choice, so be it. To reach them, we won’t make a fuss. The truth — most just can’t see it. For upside-down it’s strong — a shield against the wrong. Let no one try to free it! What crop emerges in the end from seed that we have guarded? All kernels safe and whole and free from grit, we’ll show. For how we’ll be rewarded! Thank you Rev.Hayes for the truth. It has brought out what needs to be seen by all.